Sunseeker just keep getting better and better. At a time when other builders are producing 80 footers (24.5metres) doing 35 knots, Sunseeker come out with a 95 footer with a top speed of over 45 knots. It may not seem that much when you quote the figures, but this new design takes motor yachting and Sunseeker into a whole new world. You may loose some of the excitement of high speed that you get from a small fast boat, but in terms of sophisticated performance, the Predator 95 takes some beating. 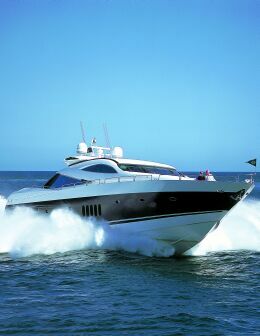 It is not just the speed that makes the Predator 95 stand out in the Sunseeker range. It is certainly one of the fastest Sunseekers for its size, but the real difference can be seen in the refined styling. 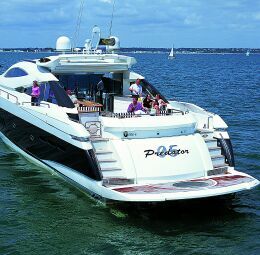 Gone are the exuberant sweeping curves of earlier Sunseeker designs, to be replaced by a much sharper style. The style is still very distinctive, but the curves are shallower, the lines are straighter and the practical aspects take a front seat. The impact of this new design is quite dramatic. It exudes performance with a low-key style, like a classic Aston Martin where the sheer scale of what is presented has its own impact and it does not need flamboyant style to exaggerate it. It is only when you stand on the quay looking up at this motor yacht that you appreciate its scale. So well proportioned are the components of this design that everything seems to fit together and you do not get any impression of its size. Then you walk along to where the bow rises at a breath-taking angle from the water and you realise that the deck is some 4 metres (13 feet) from the water. Now you realise the scale and the wonderful job the designers have done to develop this masterpiece. The profile is quite stunning in the way is matches a very deep hull to a minimalistic superstructure. The line is so sleek that the superstructure almost disappears into the hull. The way the line of the forward coachroof sweeps up below the pilothouse windows and then terminates in a low spoiler is pure poetry and the rest of the lines fall neatly into place. You can afford a hint of aggression in a yacht of this size and speed and this is achieved by adding a neat eyebrow above the front windows of the pilothouse and a low airfoil cross mast as the pinnacle of the superstructure. It has to be said the version of the Predator 95 that was tested was the top of the range model, but the style remains the same when lower power engines are specified. This prototype also had an alternative type of side window fitted in the hull. In place of a conventional row of oval ports along the hull, the middle section, which supplies light to the lower saloon, had been replaced by large vertical windows that are angled forward. These make a huge difference to the light in the saloon but they are almost invisible from the outside because they were deeply recessed in the hull and did not have the stainless steel surrounds of the oval ports. Underwater, this beauty has a conventional deep-vee hull with a deadrise of 13 degrees to give a smooth ride at speed. The steep angle of the bow is designed for a smooth entry into waves and everything points to comfortable performance except the powerful chines, which present a large flat area to the waves. These chines add a harsh note to the ride, which comes as a surprise on a yacht of this size, but really the ride comfort is quite acceptable and you have to remember that you are travelling at 45 knots. At the stern, the exhausts are integrated into side pods, which form an extension forward from the swim platform. These exhausts are boomy when alongside but all noise is soon left well behind when the Predator picks up speed and heads for the horizon. A long swim platform in necessary to give protection to the Arneson Drives below and it has been engineered so that it can be raised and lowered for easy launch and recovery of the tender. The platform has a turntable to allow a jet ski to be stowed on it and then turned for launching. The main tender is housed in a garage built into the transom with a top hinged door. Above the garage door, an ingenious extending sunbed offers generous space for sunning without intruding on the cockpit space. Forward of this sunbed is the first of a series of settees that surround the cockpit. In the starboard forward corner a bar counter complete with barbecue grill has been in corporated so that this space becomes one big entertainment centre with an extending awning above to give shelter from the sun. There are teak decks here and these run forward along the wide side decks to another sunbathing area on the coachroof forward. This one is huge, with enough space for 10 people and there are generous rope and fender lockers on each side to keep the exterior line clean and tidy. 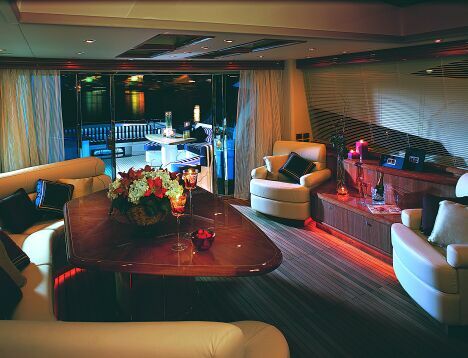 Half height bulwarks surround the whole deck and these are topped by substantial superyacht style rails. From the cockpit, a beautifully curved stainless steel door gives access to the deck lounge. Here the style has been kept deliberately simple, with quality the main factor. 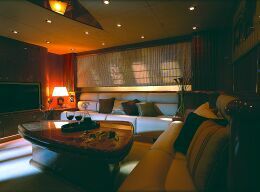 The settees are in cream leather and the furniture and trim a rich lacquered cherry wood. This leaves the focus of interest on the helm forward where four black adjustable Besenzoni seats dominate the scene. These face the walnut dash, which appears to be highly reflective but very impressive, with the engine instrumentation in the centre and the electronic displays on either side. A large sunroof can be opened up to bring fresh air and sun into the deck lounge but this does not compensate for the wide windscreen pillars that reduce visibility from the helm, particularly at the corners. Combined with the slim widows in the deck lounge, it looks as though the exterior styling has taken precedence over the interior needs. Down below, the Ken Freivokh interior follows the same subdued style. 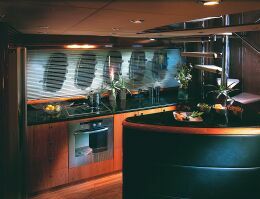 The access stairway comes down above the galley where an island counter separates this area from the saloon proper. The galley has black granite tops which, combined with the brushed stainless steel of the fridge, creates a clean, sophisticated style. This is softened by the leather and wood ambience of the saloon, which has plenty of headroom, emphasising the depth of this large hull. The vertical side windows help to confirm the size scale and bring interest and light to the saloon. Door aft leads into the full width master cabin amidships where the generous headroom adds a new dimension to yacht cabins. Here there are a number of options in the design, depending on the requirements for a crew cabin. On this prototype the two-berth crew cabin took up a corner of the master suite, but with access from an outside door. This arrangement limits the size of the bathroom, which extends to the full width if the aft crew cabin option is selected. A dressing room can also be incorporated. 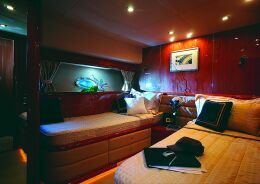 Forward of the saloon there are two twin cabins, one with bunks and then VIP cabin up in the bow. 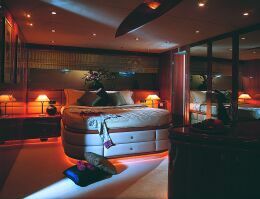 These cabins rise up in level as the hull fines away towards the bow but they all share the same quality finishes which combine with the classic style. Throughout, the bathrooms have black granite decking and tops with generous shower compartments and stainless steel fittings. The machinery compartment aft is a work of art as befits a performance yacht. The centre engine of the triple 16 cylinder MTU installation is set very low in the hull, almost disappearing between the wing engines. There is a spagetti of exhaust pipes leading aft and with so much power packed into a limit space access to some components is not as good as it might be. The 1800 hp from each engine is taken through ZF gearboxes to the Arneson Surface Drives. The powerful bow and stern thrusters make light work of manoeuvring this yacht alongside, with the thrusters linked in a form of joystick control. At low speeds, only the two wing engines are normally used, with the centre engine kept running to supply the hydraulic power for the thrusters. With power on all three engines coupled in, the throttle response is excellent with the yacht powering onto the plane with no hesitation. Before you can blink, the Predator is doing 30 knots and the speed continues to rise smoothly up to the top speed of 46 knots. Little or no adjustment is required of the Arnesons except for a slight lifting of the centre drive at full speed. Will all three engines running at 1500 rpm this yacht will cruise with an effortless stride at 30 knots to give a 600- mile range. Size counts when it comes to coping with sea conditions and the Predator 95 copes admirably although the ride does get harsher as speed rises. The pilothouse is set well forward so you are more sensitive to the sea conditions here but turning at speed is a thrilling experience with the yacht heeling into the turn in sportsboat style. Considering that this is a very high performance yacht where weight is important to performance, the designers have done an excellent job in creating a low key but quality interior. The sheer scale and performance of the Predator 95 is exciting and whilst lowered powered versions are being offered, it is hard to believe that potential owners will settle for anything less that the full power package of this innovative design.